WOW is back! 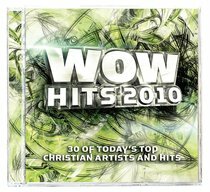 The most in-demand release of the year, WOW Hits 2010 will continue the formula that makes it such a hit among Christian music fans: 30 songs on 2 CDs containing the most popular hits heard on Christian radio. Over the last 14 years, the Christian music industry has partnered together to bring fans the best artists and songs available anywhere! WOW has and will continue to be the perfect gift for current fans and for those new to Christian music. Thirty tracks from Matthew West, Jeremy Camp, Casting Crowns, Chris Tomlin, Natalie Grant, Newsboys, Steven Curtis Chapman, David Crowder Band, tobyMac, Third Day, Britt Nicole, BarlowGirl, Sanctus Real, Hawk Nelson, RED, Jars Of Clay and more! Great selection of music. Introduces to many new artists and just a great variety of music. Great Cd!